Welcome to Wisconsin Dells Lodging. You can choose from hundreds of lodging options for your vacation in the Wisconsin Dells. The Dells is an enormously popular year round attraction for family vacationers and a “unique vacation destination" for kids and adults of all ages. Whether it’s winter or summer, there are several world class Wisconsin Dells lodging options to choose from! The Aloha Beach Resort does not offer the thrills and chills of an amusement resort, but it does offer breathtaking views and sunsets overlooking Lake Delton. Although not far away from the hustle and bustle of the Dells! Overlooking Lake Delton, is what families large and small need and want! The Reunion Magazine, November 2003 wrote a nice article on this resort because they happen to specialize in reunions. And, they are one of the very few PET FRIENDLY Wisconsin Dells Lodging Resorts. The Birchcliff Resort is "A Wooded Cabin Resort" nestled in the heart of Wisconsin forestry and just minutes from downtown Wisconsin Dells. They offer a great place to vacation and just unwind. You can spend the morning hiking to the Wisconsin River, the day at the outdoor pool, and gather around the campfire for a quiet evening. You might forget about heading to the water parks and just hang around a great Wisconsin Dells Lodging Resorts like Birchcliff. 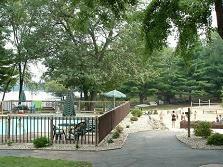 This Wisconsin Dells lodging are just a few minutes outside the Dells in wooded settings. They include attractive furnishings, complete kitchens, central air, TVs and large decks. Christmas Mountain Village is a complete year-round vacation resort. Some Wisconsin Dells lodging resorts have it all, and Christmas Mountain falls into the category. Mulligan’s Restaurant is onsite, and offers a Sunday Brunch, lunch, dinner, and even pizza delivery! Check out Chula Vista Resort for more information. We were able to watch the world famous Tommy Bartlett Water Show from our stay at the Cliffside! We rented a lakeside room with a view and it was worth every dollar! This is very reasonable as a Wisconsin Dells lodging resort go, with breathtaking views and spacious rooms. Check out Wisconsin Dells Lodging Great Wolf Lodge for more information. Check out Wisconsin Dells Lodging Ho-Chunk Casino & Resort for more information. Welcome to a Wisconsin Dells lodging resort look and feel of years gone by. This little piece of heaven is part of a small peninsula on Lake Delton. As we drove into the 15 acres of shaded seclusion, it was apparent that the owner of this property put a lot of thought into preserving the beauty of the land and the buildings as one. These, cabins are individually owned but rented out through a management company called Lake Pointe Management. In order to check in to your cabin at Island Pointe, you need to take a drive just up and across the road about a ½ mile or so at E11232 Hillside Drive. Call real early because this place books out for the summer very fast. Make memories with your family today at Island Pointe…I know we will! Check out Wisconsin Dells Lodging Kalahari Resort for more information. Check out Wisconsin Dells Lodging Polynesian Resort for more information. Check out Wisconsin Dells Lodging Treasure Island for more information. 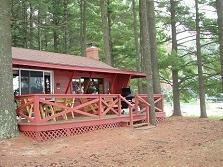 Check out Wisconsin Dells Lodging Wilderness Resort for more information.